“You wanna go on something really fast and really scary?” I asked my 5-year-old son during a recent trip to Disney’s California Adventure Park. He seemed to think that every ride we rode at the park was too slow and too boring. So I wanted to excite him. “Yeah,” my boy said with enough enthusiasm to make a cooped-up Jack Russell Terrier look like an energy-deficient loaf. “I wanna go on something really, really fast, and really, really scary.” And then my son did what he does when he gets excited. He jumped up and down. 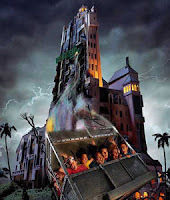 “Twilight Zone Tower of Terror” is an elevator ride that takes riders to the top of what looks like the Hollywood Tower, and then drops them straight down to the bottom. It was pure terror. And we were in line to ride it. My wife asked if it’d be too scary for our child. I said it couldn’t be worse than “Splash Mountain” or “Big Thunder,” scary rides my son had already survived and loved. I gave my wife a smile of confidence. And then I looked to see if there were other 5-year-olds in line for the ride, you know, because I didn’t want to be the only bad parent with a young one. The youngest kid in line was maybe 24 years old. As we neared the attraction, we could hear riders screaming things like, “We’re gonna die!” and we saw riders exiting the building with wet pants. My wife asked if this was a water ride. I told her it wasn’t. I excused myself from line to use the restroom. I actually sought out a park employee and asked if it was safe to bring a 5-year-old on the “Tower of Terror.” She said that bringing a 5-year-old on the ride was a horrible idea, and very dangerous. Just before I regained consciousness so I could run back to my family in line and save my son’s life, the employee laughed and said she was just kidding and that my 5-year-old would be fine. I didn’t think this woman was funny. And just before I would get on the ride, I questioned whether she was even an employee of the park at all. But at that moment, what she said was enough for me to jump back in line with my wife and kid. “This ride is going to be great,” I said with renewed enthusiasm. “Is this ride gonna be really, really fast?” my son asked me, eagerly anticipating the terror. “Yes,” I said. “It’s going to be more fun than ‘Splash Mountain’ and ‘Big Thunder’ put together.” And I meant it. My son did what he always does when he’s excited. He jumped up and down. Finally, the line of people we were waiting behind led us into the building, and into what looked like the depths of Hell, actually the elevator maintenance shaft. You could hear the roar of the elevator ride as it raced up to the top of the tower with its riders, then come plummeting down, the screams of the people even worse than the roar of the elevator car. This was a terrible idea. My son was going to die. I had to take him out of the line. And that’s when we were shoved onto the ride and buckled in. Right away, the elevator blasted off to the sky, putting my stomach on top of my toes. My son’s smile disappeared instantly. He wouldn’t survive, and I think he knew it, too. Then the elevator car came crashing down, and I wondered if the Earth’s ground had disappeared since we kept falling and falling. My son went mute. I wondered if he was gone. When we got off the ride, I checked all my son’s vitals. Surprisingly, he was alive. I asked if he was OK. He jumped up and down. Because that’s what he does when he’s excited. It seems he truly had fun.